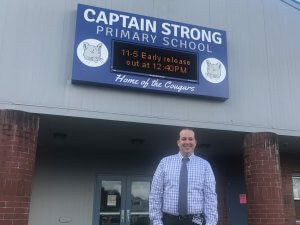 Neil Varble is the new assistant principal at Captain Strong Primary. Varble has taken over for Jennifer Kerr, who is on a leave of absence this year. Before joining the BGPS district, Varble was a fourth grade teacher in the Kelso School District. We asked Neil to tell us some things that people might not know about him. Check out his answers to get to know a little more about our new assistant principal! I have two children. My daughter, Brenna, is 4 1/2 and just started Preschool. My son, Micah, is 3 and a busy little boy! I grew up in Hendersonville, TN, a city located outside of Nashville. I graduated from the University of Tennessee at Knoxville with a bachelor’s in history. I then attended Western Kentucky University, earning a master’s in history with an emphasis in German history and completing a thesis examining German soldiers fighting in the Eastern Front during the Second World War. When I graduated, I received a Fulbright Scholarship to teach English in Vienna, Austria for a year. I then moved out to Rainier, OR and completed my master’s of education from Pacific University. Last year, I completed my administrative program through City University. Do you have any favorite sports teams? I am a huge hockey fan and my favorite team is the Nashville Predators. If you were a Marvel character, which character would you be, and why? I would probably choose to be Spider-man because it would be so much fun climbing up buildings and swinging through the city. I really like to go hiking and play with my kids. I also play guitar, but I have to keep the volume pretty low! I am excited to be a Captain Strong Cougar because it has such an incredible staff, kids, and families who welcomed me to the Cougar family right from the beginning!